Showing items in category Bahawalpur, sorted by newest listed first. BAHAWALPUR - 1950 'Silver Jubilee' set on philatelic cover to India at BAGHDAD UL JADID. 1950 (JAN.30.) 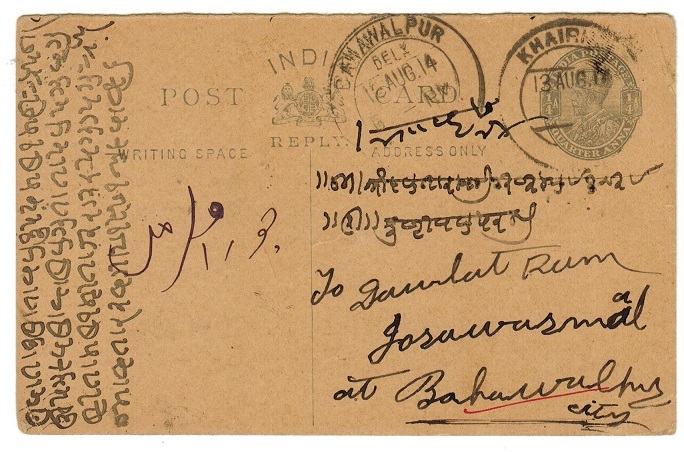 cover addressed to the Bombay Philatelic Company in India bearing the 1949 Silver Jubilee of Assccesion series (SG 39-42) tied by two d/r BAGHDAD UL JADID cds's. 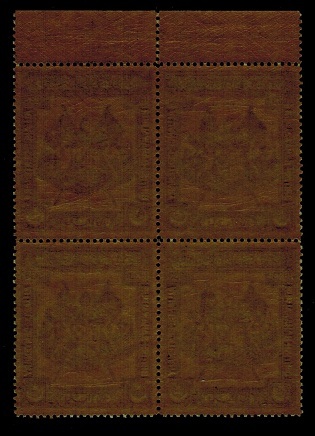 Scarce series on cover. BAHAWALPUR - 1952 registered OHMS cover to UK used at SADIQ GARH PALACE. 1952 (MAR.19.) use of ON HIS MAJESTYS SERVICE (Bahawalpur Government) cover registered to UK and bearing Pakistan 1 1/2as pair and 4as adhesives cancelled by SADIQ GARH PALACE/ BAHAWALPUR cds. Pakistan adhesives had to be used for mail sent outside of Bahawalpur. 1952 (JAN.31.) use of ON HIS MAJESTYS SERVICE (Bahawalpur Government) cover registered to UK and bearing Pakistan 4as block of ten on reverse side cancelled by SADIQ GARH PALACE/ BAHAWALPUR cds. Pakistan adhesives had to be used for mail sent outside of Bahawalpur. BAHAWALPUR - 1958 use of Pakistan 6a green aerogramme to UK used at SADIQ GARH PALACE. 1958 (22.6.) use of 6a green aerogramme of Pakistan addressed to UK and cancelled by light SADIQ GARH PALACE cds. 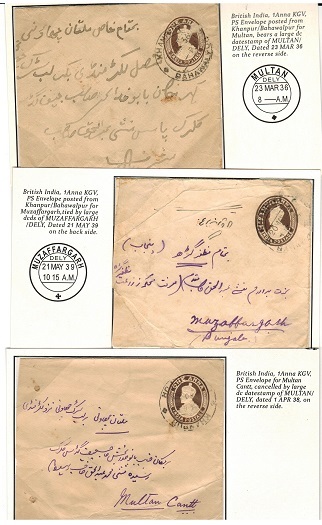 Under paid with black circular KARACHI R.M.S.AIR SET-3/T tax mark applied with '16c' applied alongside in manuscript. 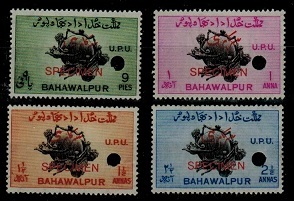 Only Pakistan stamps and stationery was valid for use outside Bahawalpur. BAHAWALPUR - 1951 cover to Pakistan bearing Pakistan SERVICE stamp used at BAGHDADUL JADID. 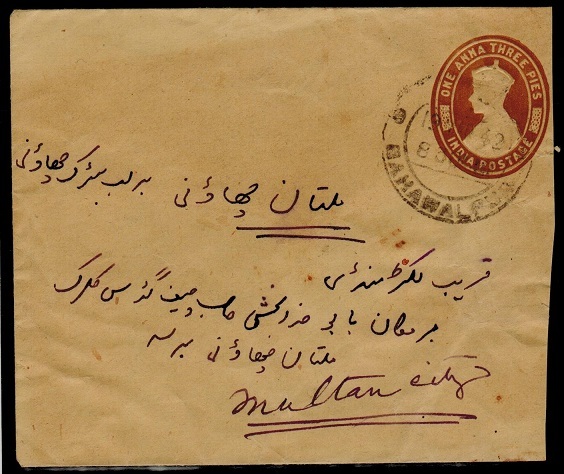 1951 use of (120x96mm) 'ON HIS HIGHNESS (Bahawalpur State)' envelope addressed to Lahore and with WAZIR-AZAM/BAHAWALPUR crest on reverse flap and countersigned on front. Pakistan 1 1/2a "SERVICE" adhesive tied to reverse by wavy lined type BAGHDADUL JADID cancel to pay postage outside the state. LAHORE GPO arrival cds dated 13.AUG.51. A rare piece of official stationery mail. 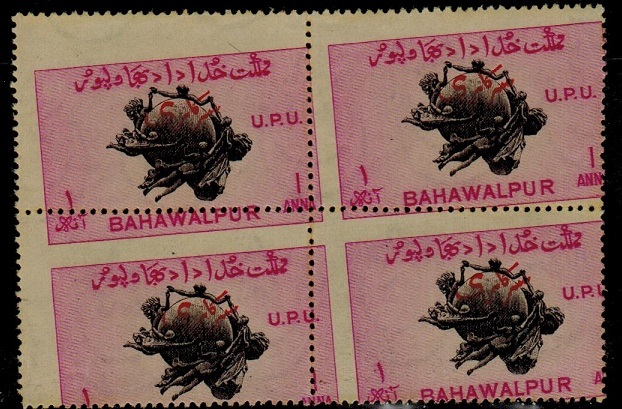 BAHAWALPUR - 1949 1a 'UPU' mint block of four with MISPLACED DESIGN. SG 029. 1949 1a black and magenta 'UPU' adhesive in a fine mint block of four (toned gum) showing GROSS MISPLACEMENT OF DESIGN. SG 029. BAHAWALPUR - 1950 local 'ON STATE SERVICE' cover bearing 1a and 2 1/2a UPU adhesives. 1950 (MAY.13.) 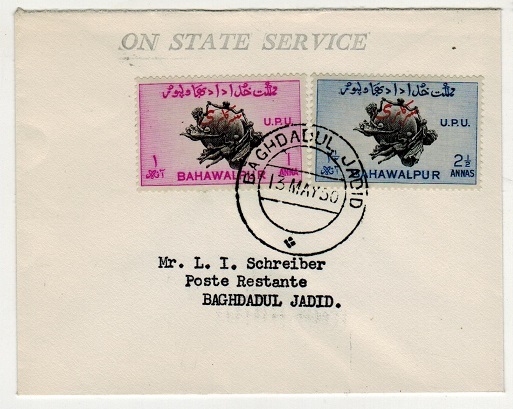 use of (118x93mm) envelope handstamped ON STATE SERVICE addressed locally to 'Poste Restante' (Schreiber) and bearing the Official overprints on the UPU 1a and 2 1/2a adhesives (SG 029+31) tied by BAGHDADUL JADID cds. Rare stamps used thus as these stamps are normally only seen as a set on philatelic covers. BAHAWALPUR - 1943 4as and 8as adhesives cancelled 'SAVE FOR DEFENCE' at KHANPUR. BAHAWALPUR - 1943 1Re violet pair cancelled 'SAVE FOR DEFENCE' at KHANPUR. BAHAWALPUR - 1913 1/2a green PSE of India registered locally uprated at AHMADPUR. H&G 9. 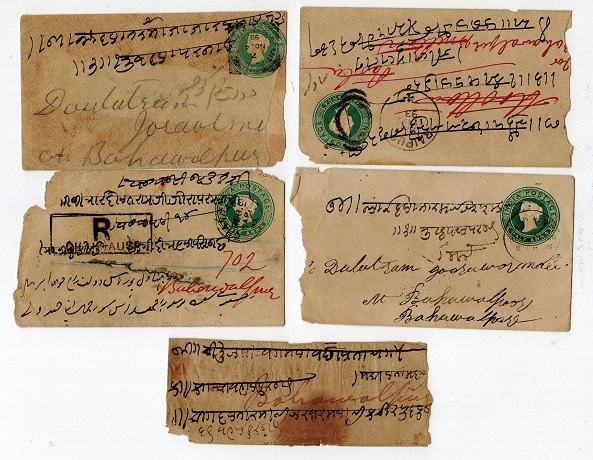 1913 1/2a yellow green on cream postal stationery envelope of India (H&G 9) registered locally in native script and bearing additional Indian 'KEDW VII' 1/2a pair and 'KGV' 2a adhesives (latter damaged) cancelled by AHMADPUR cds's and dated 23.FE.16. BAHAWALPUR d/r arrival b/s. Slightly reduced at right edge due to opening. A scarce use. BAHAWALPUR - 1904 3p rate illustrated postcard used at AHMADPUR. 1904 (DE.29.) 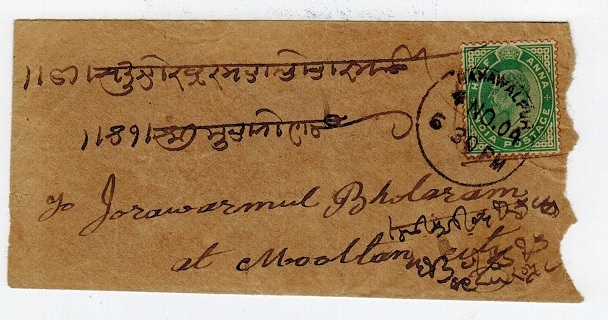 use of illustrated blue on pinkish buff (Swami Dayanand) postcard addressed in local script and bearing Indian 3p grey Edward VII adhesive tied by AHMADPUR/BAHAWALPUR cds. 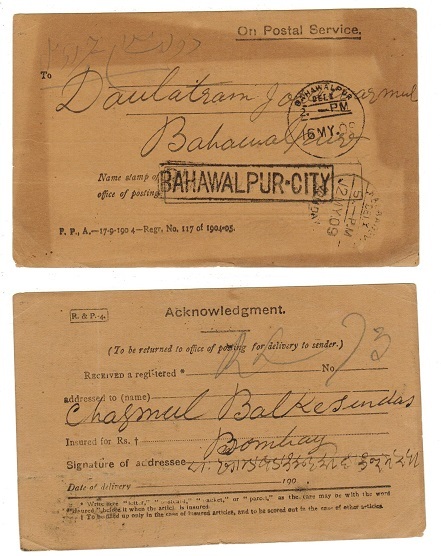 BAHAWALPUR - 1903 'On Postal Service' acknowledgement card used at Bahawalpur. 1903 (DE.15.) use of ON POSTAL SERVICE card (P.P.A. - 17.2.1902) for acknowledgement of receipt with BAHAWALPUR and BAHAWALPUR/DELY arrival cds of the following day and black boxed R/BAHAWALPUR h/s applied. 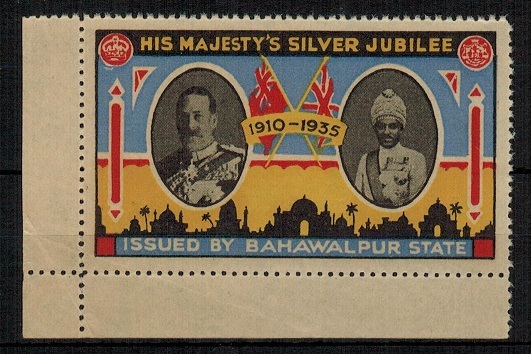 BAHAWALPUR - 1935 'HIS MAJESTY'S SILVER JUBILEE/ISSUED BY BAHAWALPUR STATE' label unused. 1935 red, blue, yellow and black HIS MAJESTY'S SILVER JUBILEE/ISSUED BY BAHAWALPUR STATE comemmoration label printed on cream perforated on un-gummed paper. 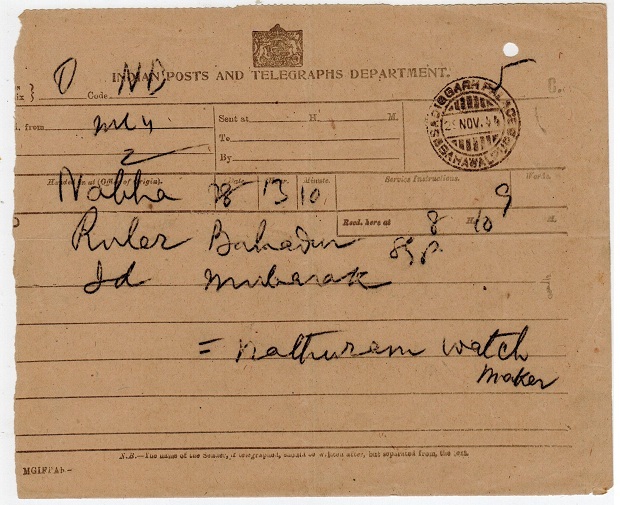 BAHAWALPUR - 1909 'TELEGRAPHS' form cancelled BAHAWALPUR/TELE. 1909 (JU.1.) 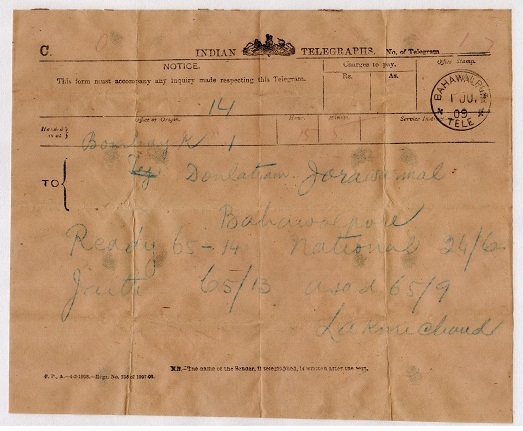 use of black on buff 'Indian Telegraphs' form cancelled by scarce BAHAWALPUR/TELE telegrams cancel. BAHAWALPUR - 1905 'TELEGRAPHS' form cancelled BAHAWALPUR. 1905 (FE.3.) 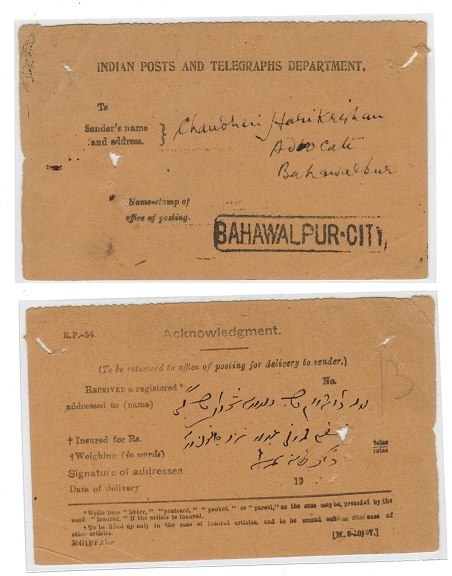 use of black on buff 'Indian Telegraphs' form cancelled by BAHAWALPUR cds. BAHAWALPUR - 1939 pair of Indian PSC's (faults) used in Bahawalpur. 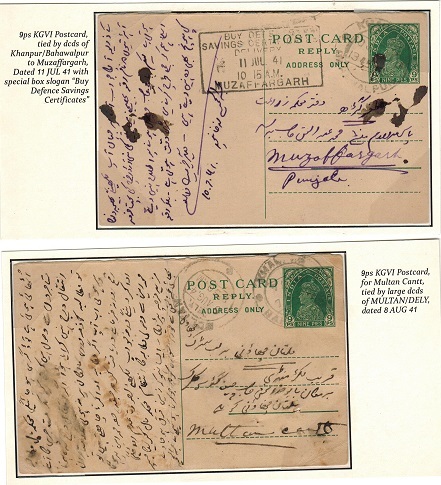 1939 pair of postal stationery postcards (H&G 47 outward and reply) each cancelled by KHANPUR/ BAHAWALPUR cds's. Two cards on original album leave as all have heavy folds and partly adhered on reverse. Faults but a scarce pair so used. BAHAWALPUR - 1936 range of three Indian PSC's (faults used in Bahawalpur. 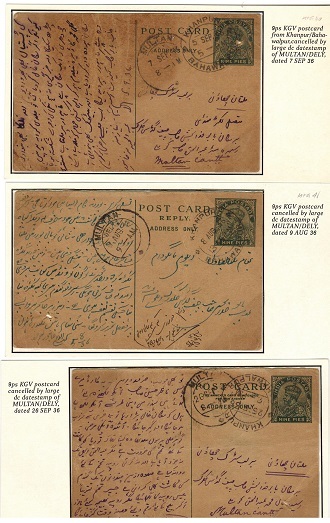 1936 range of 'KGV' Indian postal stationery postcards (H&G 40 and 41 plus reply section card showing 'The Annexed Card' instruction) all cancelled by KHANPUR/BAHAWALPUR cds's. Three cards on original album leave as all have heavy folds and partly adhered on reverse. Faults but a scarce trio so used. BAHAWALPUR - 1936-39 range of three Indian PSE's (faults) used in Bahawalpur. 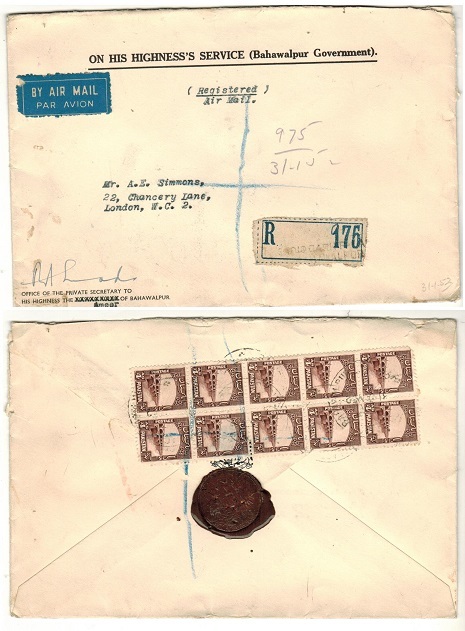 1936, 1938 and 1939 uses of the Indian 1a brown on cream postal stationery envelopes all cancelled by KHANPUR/BAHAWALPUR cds's. The three envelopes on original album leave as all have folds and faults and are partly adhered on reverse. A scarce trio never the less. BAHAWALPUR - 1941 local commercial cover used at KHANPUR. 1941 (APR.24.) 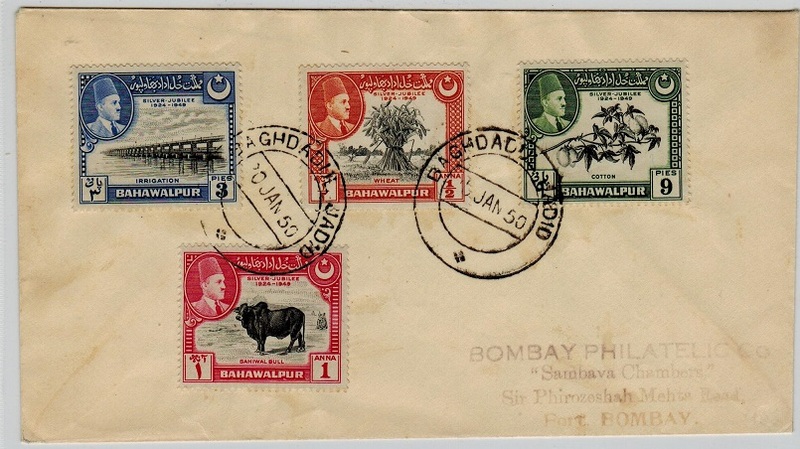 commercial cover addressed locally bearing Indian 3p grey strip of four plus a single tied on reverse flap by KHANPUR/BAHAWALPUR cds with MULTAN/DELY strike alongside. 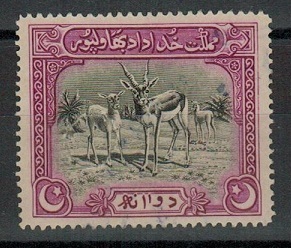 BAHAWALPUR - 1939 1a3p yellowish fawn PSE of India used in Bahawalpur. H&G 18. 1939-41 1a3p yellowish fawn on cream postal stationery envelope of India (slightly cut down) tied by BAHAWALPUR cds dated 19.MAR.42 with MULTAN b/s. H&G 18. BAHAWALPUR - 1938 1a rate cover used at KHANPUR. 1938 (AP.6.) 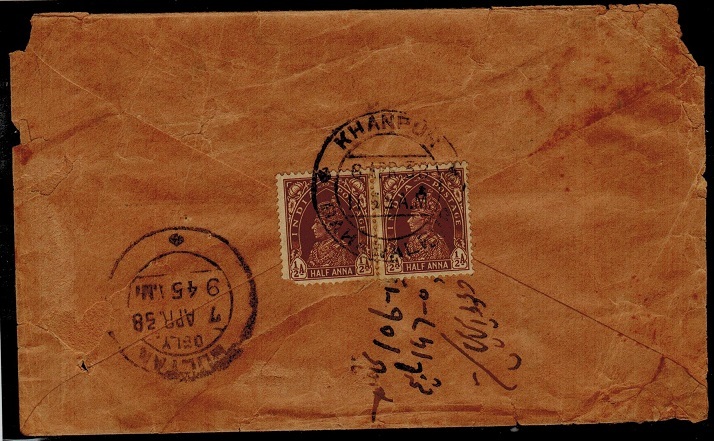 commercial cover addressed to India bearing Indian 1/2a brown adhesive pair tied to the reverse flap by KHANPUR/BAHAWALPUR cds. The cover has faults with tears at edges and is in a delicate state. MULTAN/DELY b/s. BAHAWALPUR - 1936 9p green PSC of India used at KHANPUR. H&G 38. 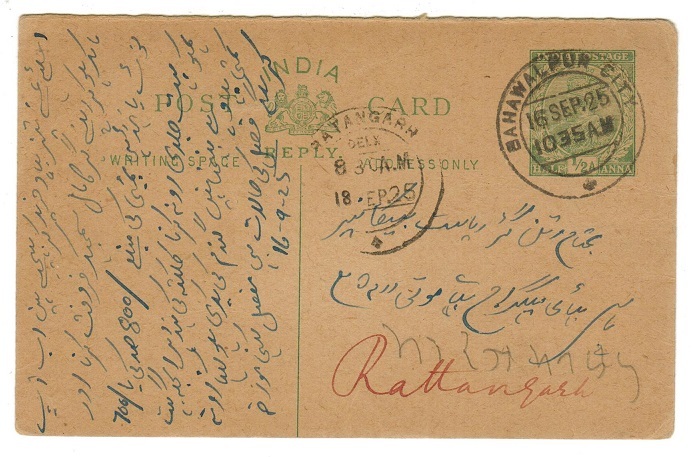 1936 9p green on buff postal stationery postcard of India (H&G 38) addressed locally to Multan Cantonment (corner fault, toned and very heavy vertical fold) cancelled by KHANPUR/ BAHAWALPUR cds dated 25.APR.37. MULTAN arrival cds at left. 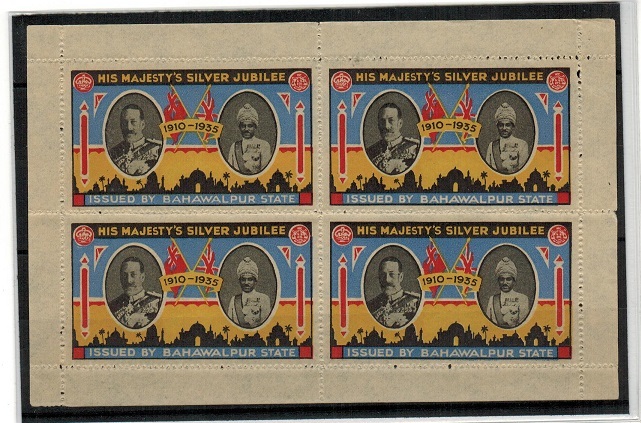 BAHAWALPUR - 1935 'Silver Jubilee' label unused sheetlet of four. 1935 red, blue, yellow and black HIS MAJESTY'S SILVER JUBILEE/ISSUED BY BAHAWALPUR STATE commemoration label printed on cream perforated on un-gummed paper in a fine marginal block of four. Very elusive and rarely seen or offered. 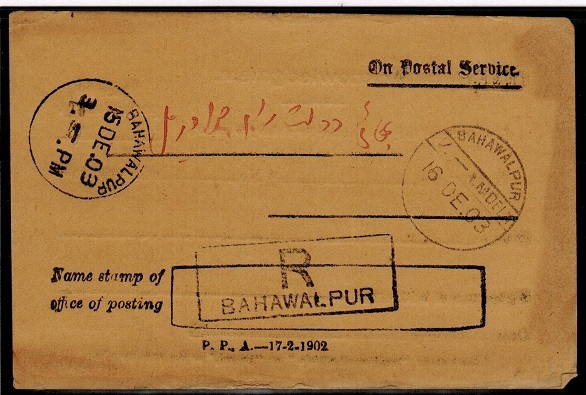 BAHAWALPUR - 1962 issue Post office acknowledgement postcard cancelled by boxed BAHAWALPUR h/s. 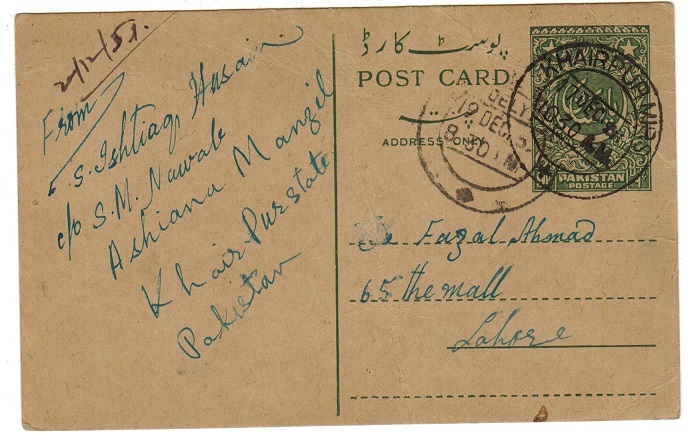 1962 issue black on cream 'Pakistan Post and Telegraphs Department' acknowledgement postcard addressed locally and struck by black boxed BAHAWALPUR handstamp. 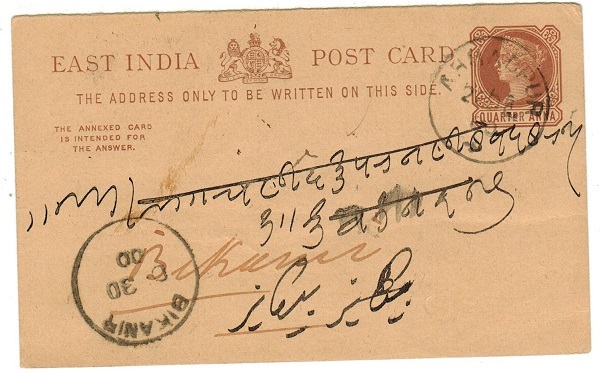 BAHAWALPUR - 1937 issue Post Office acknowledgement postcard cancelled BAHAWALPUR CITY. 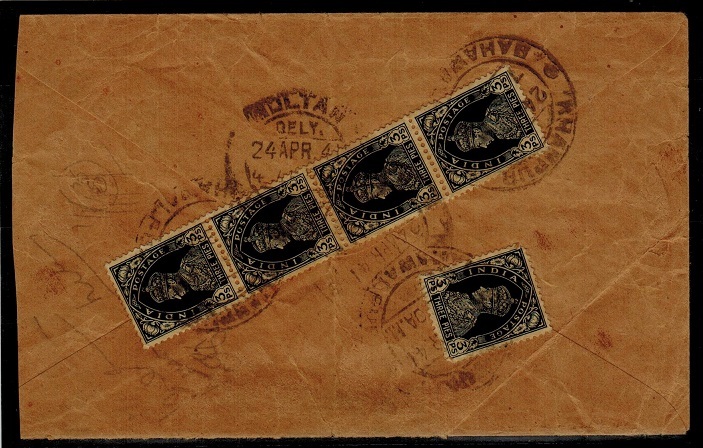 1937 issue black on cream 'Indian Post and Telegraphs Department' acknowledgement postcard (faults) addressed locally and cancelled by black boxed BAHAWALPUR CITY handstamp. BAHAWALPUR - 1954 9p green PSC of India used at KHAIRPUR MIRS. H&G 11. 1954 9p green on dark buff postal stationery postcard of pakistan (H&G 11) addressed to Lahore in India (surface creasing) and cancelled by scarce KHAIRPUR MIRS cds dated 17.DEC.51. This dating proving a three year earlier issue date than ther H&G suggests. A scarce use of this stationery in Bahawalpur in the post 1949 period before it merged into West Pakistan in 1955. 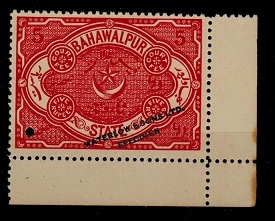 BAHAWALPUR - 1910 reply 1/4a grey Indian PSRC used at KHAIRPUR. H&G 20. 1910 reply section of the 1/4a+1/4a grey on cream postal stationery postcard of India (H&G 20) tied by KHAIRPUR cds with BAHAWALPUR/DELY inward cds alongside dated 16.AUG.14. BAHAWALPUR - 1909 (toned) ON POST SERVICE card used at BAHAWALPUR. 1909 (MY.12.) use of inward ON POSTAL SERVICE card (P.P.A. - 17.9.1904) for acknowledgement of receipt of a registered letter from India (toned) with unusual BAHAWALPUR/ DELY arrival cds (very small lettering) dated 16.MY.09 with black boxed BAHAWALPUR-CITY h/s. BAHAWALPUR - 1922 reply 1/2a Indian PSRC used at BAHAWALPUR CITY. H&G 29. 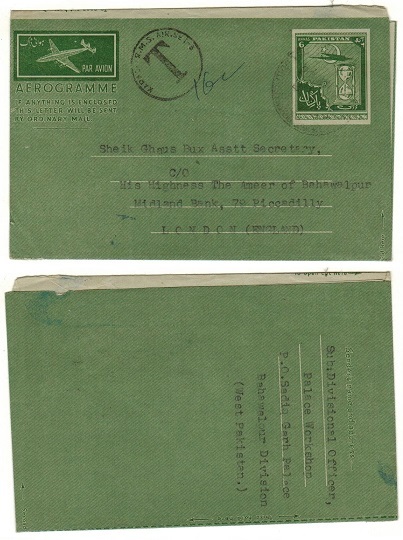 1922 reply section of the Indian 1/2a+1/2a green on buff postal stationery reply postcard (H&G 29) addressed in local script and cancelled by BAHAWALPUR CITY d/r cds dated 16.SEP.25. BAHAWALPUR - 1890 outward 1/4a Indian PSRC used at AHMADPUR. H&G 8. 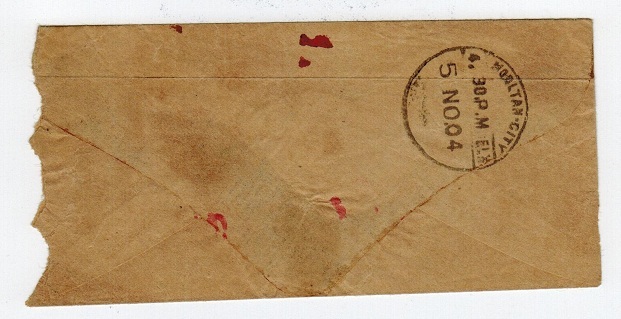 1890 outward section of the 1/4a+1/4a red-brown on buff Indian postal stationery postcard (H&G 8) addressed in local script and cancelled by the AHMADPUR cds dated 2.DE.00. BAHAWALPUR - 1890 inward Indian 1/4a PSC cancelled BAHAWALPUR/DELY. H&G 7. 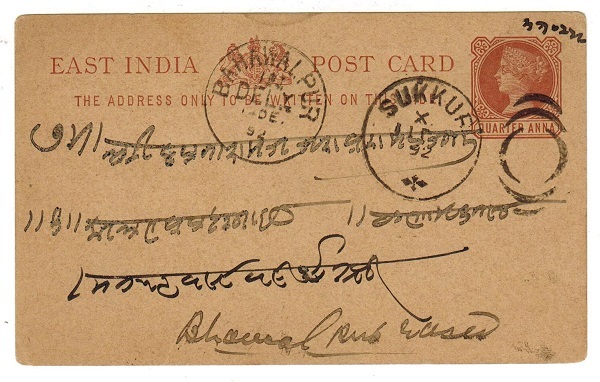 1890 1/4a red-brown on buff Indian postal stationery postcard (H&G 7) addressed in local script and cancelled by the six moon shape cancellator with SUKKUR cds alongside dated 11.DE.92 and with BAHAWALPUR/DELY cds alongside of the following day. BAHAWALPUR - 1933 2r black and blue PREPARED BUT UNISSUED mint adhesive. 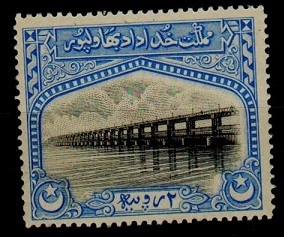 BAHAWALPUR - 1933 2r black and blue "Panjnad Weir" adhesive in fine mint condition. Prepared for issue but not released to the public. Few known. (SG type 01) but in unissued colour and without overprint. 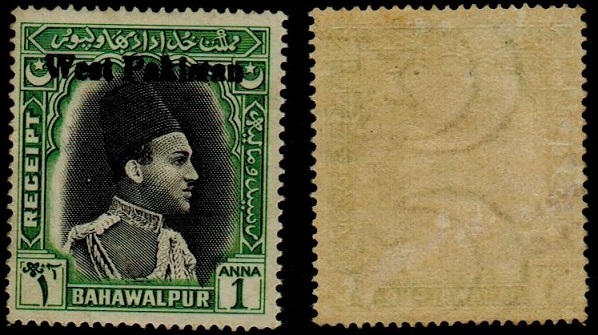 BAHAWALPUR - 1933 1r black and orange PREPARED BUT UNISSUED mint adhesive. 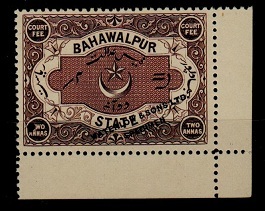 BAHAWALPUR - 1933 1r black and orange "Temple at Pattan Munara" adhesive in fine mint condition. Prepared for issue but not released to the public. Few known. (SG type 06) but without overprint. BAHAWALPUR - 1933 8a black and purple PREPARED BUT UNISSUED mint adhesive. 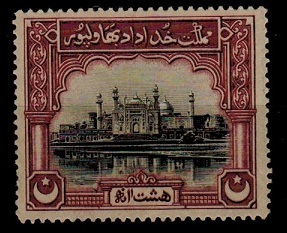 BAHAWALPUR - 1933 8 a black and purple " Friday Mosque, Fort Derawar" adhesive in fine mint condition. Prepared for issued but not released to the public. Few known. (SG type 05) in the unissued colour and without overprint. 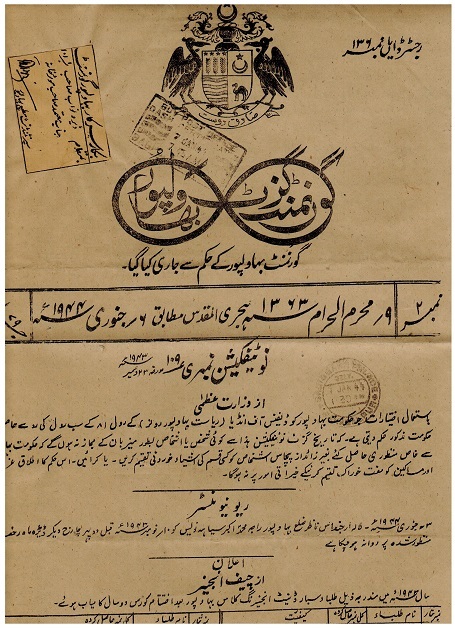 BAHAWALPUR - 1944 Government Gazette sent from Bagdaduljadeed to the Sadiq Palace. 1944 (JAN.7.) Government Gazette paper sent from Bagdaduljadeed to the Palace cancelled at top by boxed BUY POST OFFICE/CASH CERTIFICATES/BAGDADULJADEED handstamp and with d/r SADIQ GARH PALACE./BAHAWALPUR/DEL cds below dated the same day. An unusual item. BAHAWALPUR - 1933 2a UNISSUED adhesive mint with gum (repaired official hole). BAHAWALPUR - 1933 2a black and bright purple 'blackbuck' adhesive (SG type 03) that was prepared but not issued with official punch hole (repaired with the piece punched out) and with much of the original gum. A scarce stamp. 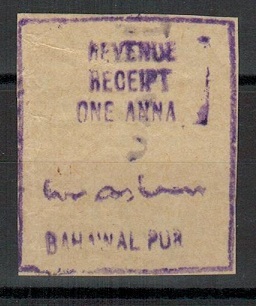 BAHAWALPUR - 1930/40 (circa) ONE ANNA violet on cream REVENUE RECEIPT label. 1930/40's circa violet on buff REVENUE/RECEIPT/ONE ANNA/BAHAWALPUR adhesive on thick brown gum. 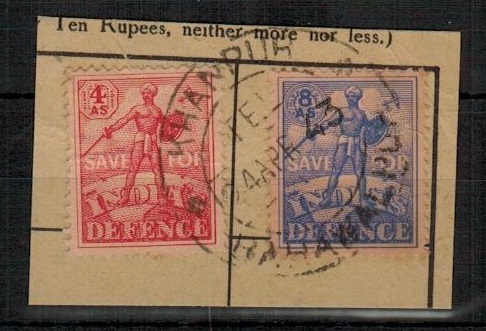 BAHAWALPUR - 1945 1a 'revenue' official fine used. SG 07. 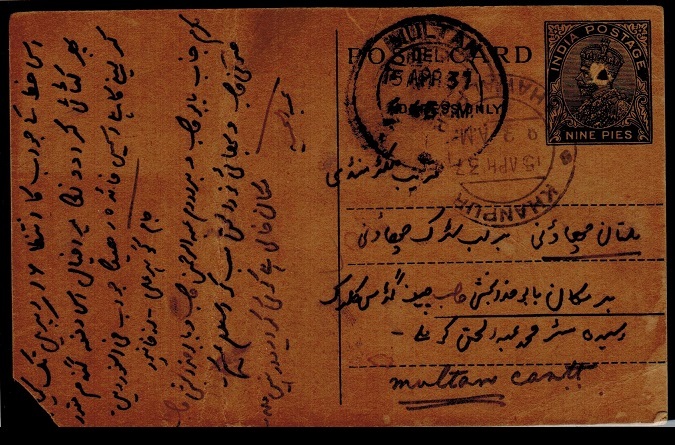 BAHAWALPUR - 1945 1a black and brown 'revenue' adhesive cancelled by fine BAHAWALPUR cds dated 1.APR.45. Elusive stamp. SG 07. 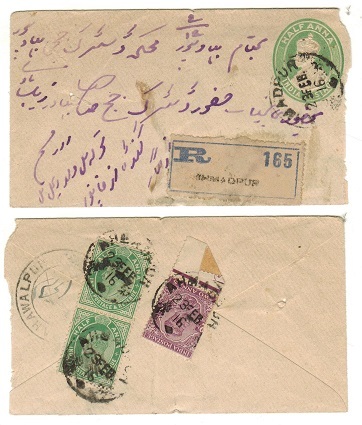 BAHAWALPUR - 1893-98 range of inward covers with BAHAWALPUR cancels. 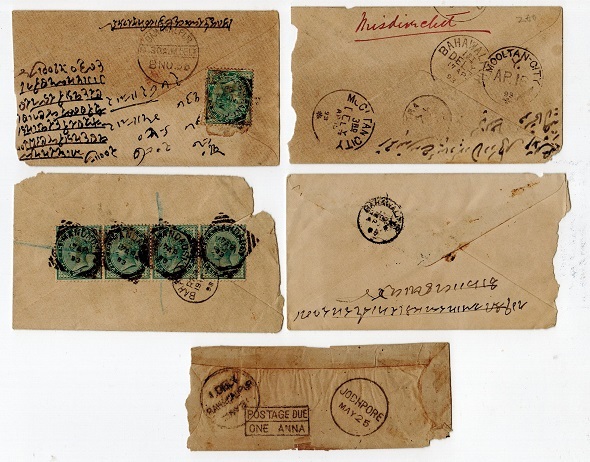 1893/1898 range of four Indian 1/2a green postal stationery envelopes all addressed inward with various BAHAWALPUR arrival b/s's. Also a further small sized unstamped wrapper from Jodhpur with boxed POSTAGE DUE/ONE ANNA h/s applied with DELY/BAHAWALPUR arrival cds at left. (5 inward covers). 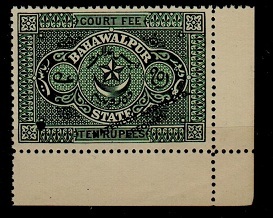 BAHAWALPUR - 1897 10r green COURT FEE adhesive overprinted WATERLOW AND SONS. BAHAWALPUR - 1897 10r green COURT FEE adhesive printed on ungummed perforated paper as issued & ovpt'd WATERLOW & SONS LTD/SPECIMEN with additional official punch. BAHAWALPUR - 1897 5r vermilion COURT FEE adhesive overprinted WATERLOW AND SONS. BAHAWALPUR - 1897 5r vermilion COURT FEE adhesive printed on ungummed perforated paper as issued & ovpt'd WATERLOW & SONS LTD/SPECIMEN with additional official punch. BAHAWALPUR - 1897 2r purple COURT FEE adhesive overprinted WATERLOW AND SONS. BAHAWALPUR - 1897 2r purple COURT FEE adhesive printed on ungummed perforated paper as issued & ovpt'd WATERLOW & SONS LTD/SPECIMEN with additional official punch. 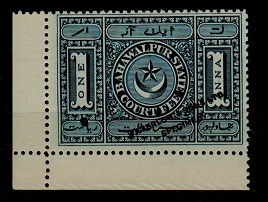 BAHAWALPUR - 1897 1r light blue COURT FEE adhesive overprinted WATERLOW AND SONS. BAHAWALPUR - 1897 1r COURT FEE adhesive printed on ungummed perforated paper as issued & ovpt'd WATERLOW & SONS LTD/SPECIMEN with additional official punch. Printed in light blue & as such unlisted by Ron Wood. Scarce item. 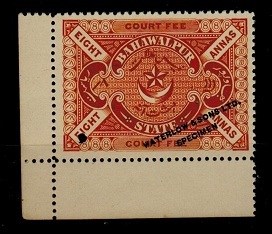 BAHAWALPUR - 1897 8a orange COURT FEE adhesive overprinted WATERLOW AND SONS. BAHAWALPUR - 1897 8a orange COURT FEE adhesive printed on ungummed perforated paper as issued & ovpt'd WATERLOW & SONS LTD/SPECIMEN with additional official punch. 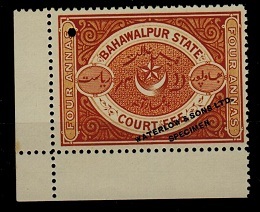 BAHAWALPUR - 1897 4a light yellow brown COURT FEE adhesive overprinted WATERLOW AND SONS. BAHAWALPUR - 1897 4a light yellow brown COURT FEE adhesive printed on ungummed perforted paper as issued & ovpt'd WATERLOW & SONS LTD/SPECIMEN with additional official punch. 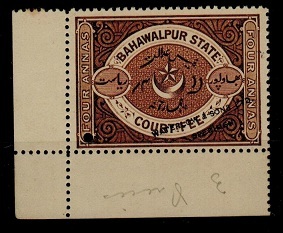 BAHAWALPUR - 1897 4a dark brown COURT FEE adhesive overprinted WATERLOW AND SONS. BAHAWALPUR - 1897 4a dark brown COURT FEE adhesive printed on ungummed perforated paper as issued & ovpt'd WATERLOW & SONS LTD/SPECIMEN with additional official punch. 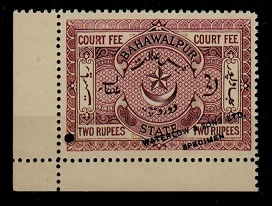 BAHAWALPUR - 1897 2a deep purple brown COURT FEE adhesive overprinted WATERLOW AND SONS. BAHAWALPUR - 1897 2a deep purple brown COURT FEE adhesive on ungummed perforated paper as issued & ovpt'd WATERLOW & SONS/SPECIMEN with additional official punch. 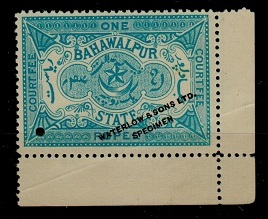 BAHAWALPUR - 1897 1a steel blue COURT FEE adhesive overprinted WATERLOW AND SONS. BAHAWALPUR - 1897 1a steel blue COURT FEE adhesive on ungummed perforated paper as issued & ovpt'd WATERLOW & SONS LTD/SPECIMEN with additional official punch. 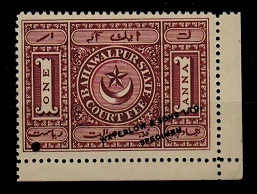 BAHAWALPUR - 1897 1a purple-brown COURT FEE adhesive overprinted WATERLOW AND SONS. BAHAWALPUR - 1897 1a purple brown COURT FEE adhesive printed on ungummed perforated paper as issued & ovpt'd WATERLOW & SONS LTD/SPECIMEN with additional official punch. 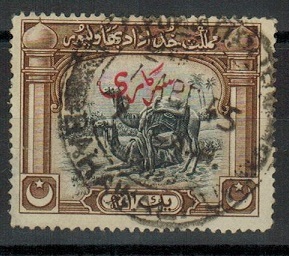 BAHAWALPUR - 1948 1r-10r colour changes fine used. SG 35-38. BAHAWALPUR - 1948 1R-10R 'Colour change' series of four values in very fine `cto' condition. SG35-38. 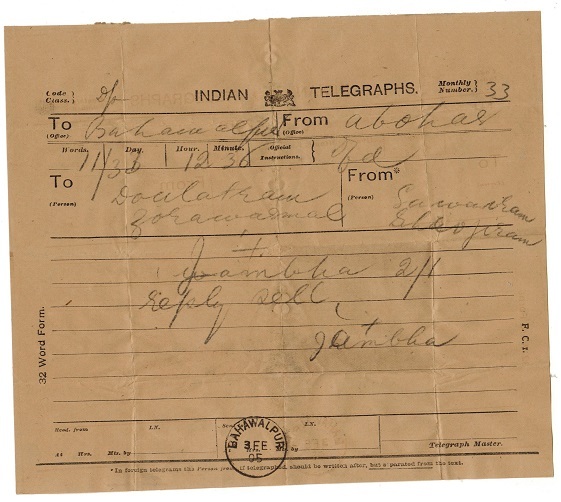 BAHAWALPUR - 1944 TELEGRAM form used at SADIQ BARH PALACE. BAHAWALPUR - 1944 (NOV.29.) 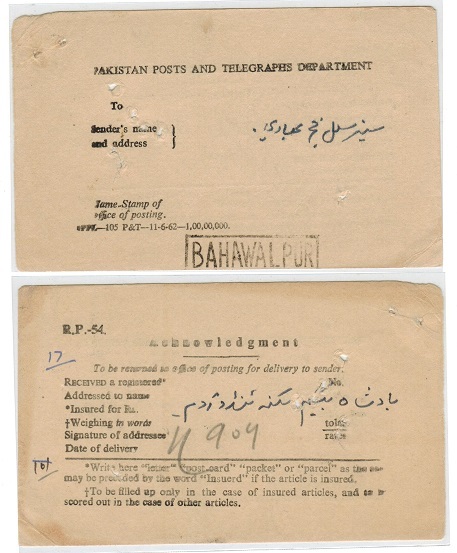 'Indian Posts and Telegraphs Department' telegram to Nabha cancelled by SADIQBARH PALACE/BAHAWALPUR 'barred' cds. 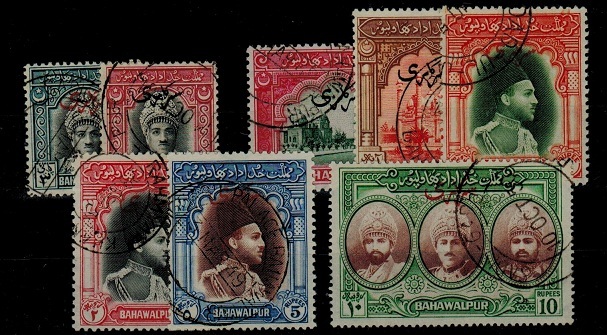 BAHAWALPUR - 1948 Official set of 8 fine used. SG 020-027. BAHAWALPUR - 1948 `Official' series of eight values. A fine `CTO' series but with some differing dated examples. A scarce issue nevertheless. SG 020-027. 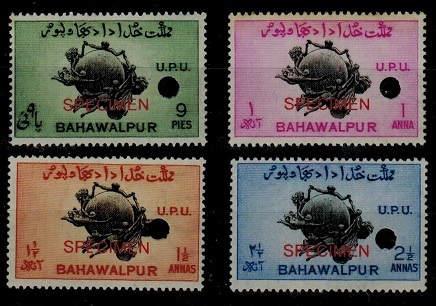 BAHAWALPUR - 1949 UPU set SPECIMEN. Status unknown. SG 43-46. BAHAWALPUR - 1949 UPU set of four ovpt'd SPECIMEN in red on ungummed paper & with security punch hole at right. Unlisted by SG in specimen form and status unknown. SG43-6. BAHAWALPUR - 1949 UPU official set of four ovpt'd SPECIMEN in red on ungummed paper with security punch hole at right. Unlisted by SG in specimen form and status unknown. SG O28-31. BAHAWALPUR - 1945 1a Bahawalpur Receipt stamp overprinted WEST PAKISTAN in mint condition. BAHAWALPUR - 1945 1a grey and green BAHAWALPUR RECEIPT adhesive (SG type 10 depicting the Amir) overprinted WEST PAKISTAN in black and with large amount of original gum on reverse. 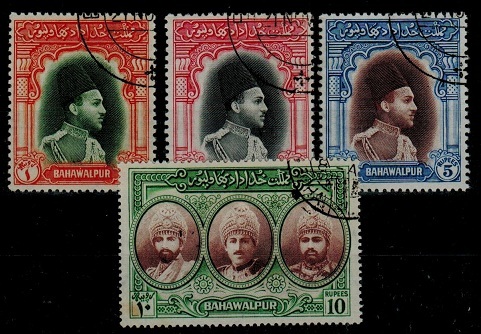 BAHAWALPUR - 1933 1a 'Centenary' adhesive in U/M block of four. 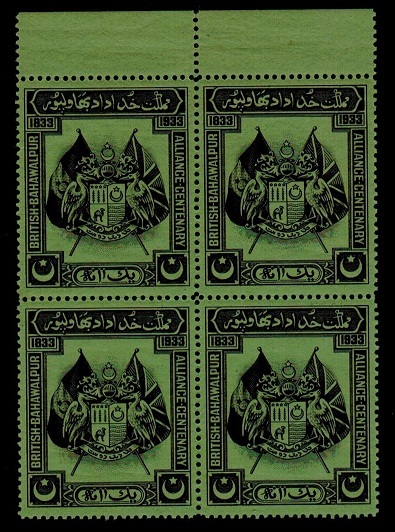 BAHAWALPUR - 1933 1a black on green 'Centenary Of Alliance' adhesive in a very fine unmounted mint top marginal block of four. Dark arabic gum as usual. Unlisted by 'SG' but noted by 'B&K' (BK X1). 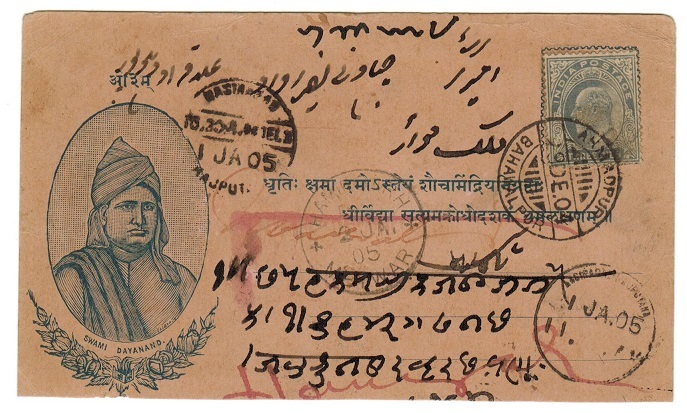 BAHAWALPUR - 1904 local cover with Indian 1/2a used at BAHAWALPUR. BAHAWALPUR - 1904 (NO.4.) 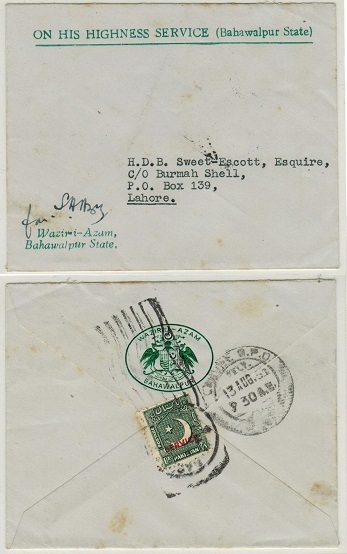 cover addressed in local script bearing Indian 'EDW VII' 1/2a green adhesive tied by s/r BAHAWALPUR cds. BAHAWALPUR - 1948 Official BOOKLET. 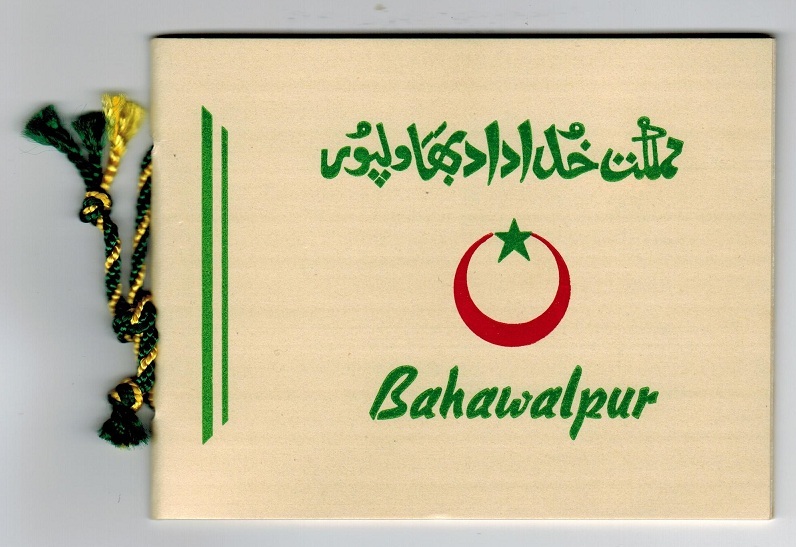 BAHAWALPUR - 1948 special official presentation BOOKLET printed in green and red on cream cover (130x100mm) with tie at left. Contains 'Official' 3p, 4a, 1r, 2r and 10r adhesives (SG 020,23,24,25 and 27) together with 5r (SG 31) on individual pages with interleaves. 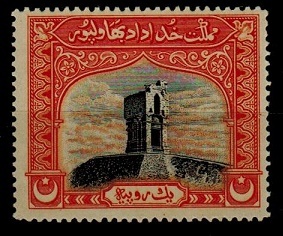 A limited edition numbered on reverse in red. A rare 'KGVI' item.